Have you noticed the increasing amount of goaltenders spending the majority of time on their knees when the puck is in their zone? In my opinion, many goalies are overusing a goaltending technique called the post wrap (other names includes post jam or reverse ‘vh’). 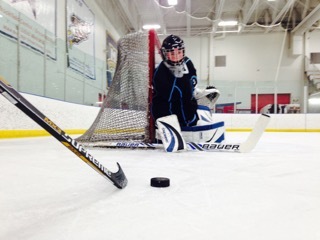 The post wrap is a position when a goaltender is on his knees and seals his skate blade or boot of the pad firmly against the post. He seals the lower half of the net with his pads, presses his body weight up against the post and uses his hands to seal any holes above the pads. The main advantage of this position is that helps eliminate goals on plays where the goalie has to hold his ground on the post, such as wraparounds or goal-mouth scrambles that originate on either side of the net. 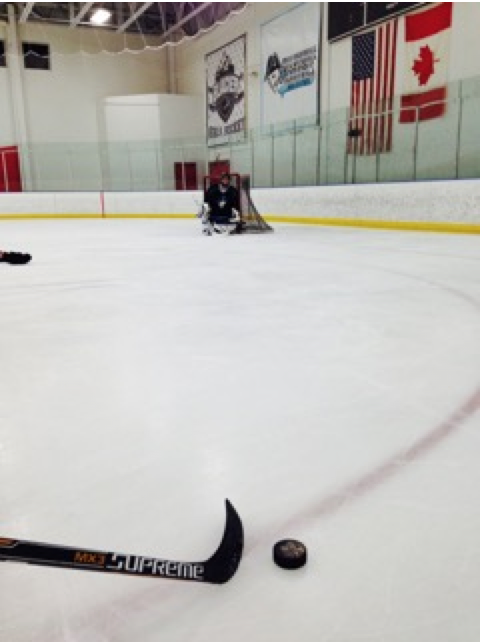 It is also very effective when a player gets a bad-angle shot and is within a few feet of the crease. Although there is a time and place to utilize this position, I feel there are two main instances when goalies have continuously had issues overusing it. The first situation occurs when a player carries the puck from above the goal line to below the goal line. Some goalies immediately drop to their knees when the player gets below the goal line even though the player is still at least 15-20 feet away from the net. I feel the goalie can be on his feet until the shooter gets within a stick length away from the net. Until that point, the goalie should be patient and play as big as possible. 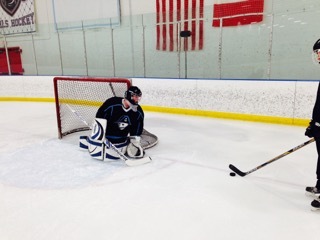 Many times, a shooter will continue behind the net with the puck and force the goalie to move post to post with him. In the past, a goalie would just use a hard shuffle to get from post to post if he had time. Many elite goalies now slide post to post on their knees and move from a pad wrap on one post to a pad wrap on the other post. The problem occurs when the player doesn’t try to beat the goaltender on a direct wraparound, but rather makes a pass or continues to walk into the slot himself. It is very difficult to transition quickly and precisely by pushing off the posts. Top-end professional goalies have spent thousands of hours mastering the precision of their pushes, which is why the move looks so efficient. I have seen countless goals get scored because the goalie went post to post on his knees following the play around the net and the player slid the puck to an open opponent “back door.” Most goalies will just end up sprawling out and never get their body in a position to make the back door save. I feel that a goalie could get a better push by pushing from the post or the crease area (if you gapped up tight to the shooter) on their feet. The second circumstance deals with a bad-angle shot originating from below the face-off dots either on a rush or an in-zone turnover. The goals were scored because the goalie was comfortable being back in his net and hugging the post even though the shooter was more than a few feet outside the crease. In all instances, the shooter lifted to puck to the top corner over the goalies shoulder and next to his head. 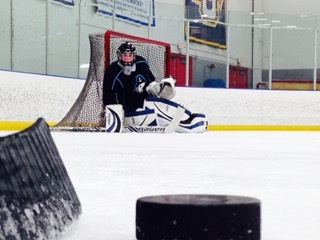 Players at high levels have noticed that goalies are down early and can elevate the puck over their short-side shoulder. This movement can be very effective for very tall goalies, but I have seen Ben Bishop (6-foot-7) of the Tampa Bay Lighting still get beat short-side high. We must be more patient on the blocker side especially because our shoulder drops down when we lay our paddle on the ice. I suggest staying more square to the shooter, but being less aggressive on the challenge if there is a back door threat. Another option would be to use the post leg up position either in front of the post or directly on the post. We feel the post leg up is most effective when a shooter gets within a stick length of you. My biggest pet peeve is when a goalie is on his knees and the puck is on the hashmarks by the boards. I feel that the transition of the game is too quick and players can elevate the puck too rapidly for any goalie to give up ground in his crease. If you have noticed any of these circumstances giving you problems in your game, then I suggest working on the “quality” of the post wrap and not always the “quantity” of reps in that position.